Special end areas are the regions of a tubular not inspected by full-body systems such as a phased array or EMI. Untested lengths vary by inspection method and tubular end connector (plain end, threaded, etc.). In general, however, untested ends are limited to 18 inches or less in length. During a special end area inspection (SEA), we examine the full circumference of this untested length on both the inner diameter and outer diameter to ensure complete inspection coverage of the tubular. Recently, Patterson Tubular Services, Channelview, implemented active magnetization units that replace the central conductor method of inducing a residual magnetic field in the tubular. The largest benefits of active magnetization include being able to switch the direction of the magnetic field without a coil and not magnetizing the entire length of the tubular—only the areas being inspected get magnetized. To meet our customer’s specific operational needs, we perform several methods of SEA. The method used is determined by the tubular material and customer requirements. We can perform each of the following methods on tubulars with plain ends, threads, upsets, couplings, and integral connections. Wet/Dry Magnetic Particle: Magnetic particles are made of a small, ferrous material that varies in size and shape to provide uniform coverage of the inspection area. With either wet or dry magnetic particle, the material inspected must be ferromagnetic and clean of loose debris. In general, wet magnetic particles are more sensitive than dry particles because the fluid holds the particles in suspension and aids in overcoming surface obstacles. We start the process by magnetizing each tubular in the longitudinal direction with a “shooting rod” prior to inspection to create a residual magnetic field. With our new active magnetism units, this is simply part of the inspection process. For a dry magnetic particle inspection, the particles are dusted onto the tubular. The direction of the magnetic field is then changed to the transverse direction (a magnetic coil is required for the residual magnetism method) and again inspected for indications. Wet magnetic particle is our most common SEA service. Liquid Penetrant: Unlike magnetic particle, this method works on all ferrous and non-ferrous materials alike. The test area must first be adequately cleaned to remove any dirt or loose scale that could keep penetrant out of a discontinuity. Liquid penetrant is applied and allowed to dry. 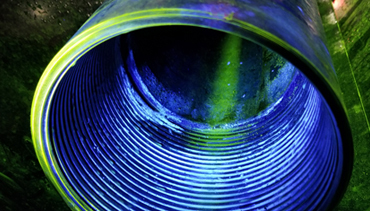 Excess penetrant is removed and an application developer is then applied, drawing out any remaining penetrant from defects to form visible indications. The inspector interprets and records the results before cleaning the remaining penetrant from the tubular. Ultrasonic Testing (UT): This convenient testing method can be performed on ferrous and non-ferrous materials using a hand-held UT flaw detector. This method is capable of detecting longitudinal, transverse, and oblique discontinuities as well as measuring the wall thickness.